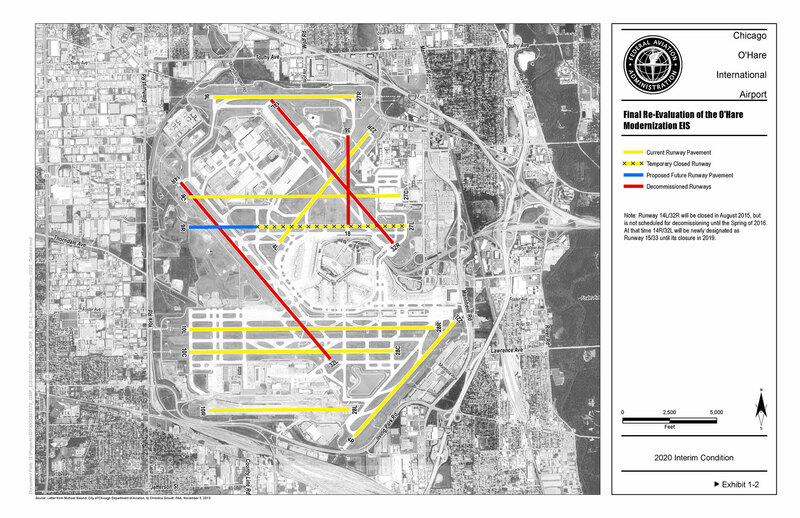 In 2005, the FAA approved an Environmental Impact Statement (EIS) for major improvements to Chicago O’Hare International Airport (ORD). The modernization program was driven by the need to improve the safety and efficiency of the airport, and included the reorientation of its eight runways from a triangular pattern to a primarily east-west configuration. In November 2013, following the settlement of litigation by two major airlines against the City of Chicago over the timing and funding of the improvements, the City announced a major change in the construction schedule altering the order of the runway projects and extending the overall project completion date from 2013 to 2021. The changes prompted the FAA to undertake a re-evaluation of the interim impacts of two runway configurations and time frames that had not been addressed in the original EIS. HMMH served as the prime consultant for the re-evaluation, managing a multidisciplinary team of six firms. Tasks included participation in a re-evaluation of the operations and enplanement forecasts assuring consistency with the findings of the original EIS, a NEPA environmental analysis focusing on noise and land use, surface transportation, air quality, climate and cumulative impacts, and collaboration with the City’s Total Airspace and Airport Modeler (TAAM) team to obtain operational data for the analysis. A large public outreach effort included development of a project website containing early versions of model inputs and outputs for public scrutiny, release of the Draft Re-Evaluation in hard copy to 73 public libraries for public comment, and a series of four public workshops with 70 exhibit boards on display, TAAM animations of taxi movements and flight operations, court reporters and translators available to take testimony from the public, and over 60 FAA and consultant staff available on site to answer questions and provide assistance to the more than 2,200 attendees. The Final Re-Evaluation included formal written responses to a total of 13,650 individual comments. Despite extremely tight deadlines, HMMH completed the project at an accelerated pace on time and under budget.